We had just returned from my daughter's wedding in Johannesburg, when there was a ring at the gate. The UPS Courier had a parcel for me!!! A big box all the way from Stylecraft in England. The other unpacking and tidying was immediately abandoned so that I could shred my way through box tape to get to the contents of the mystery box. There were two grey plastic bags inside the box.......... but the contents had to remain a mystery. One of the many joys of being a Stylecraft Blogstar is the bi-annual Blogstar Meet Up at the Stylecraft Mill in Slaithwaite, West Yorkshire. This year's Spring get together was last weekend and the two goodie bags were sent well in advance to be opened on Saturday the 4th. Looking at those bags every day for more than two weeks and not being able to open them was TORTURE. I squished and squished (every day) and determined that, yep, the content was definitely yarn! Of course that only made the waiting worse! The "local" BLOGSTARS kicked off their weekend on the Friday, 3 February already and you can read all about their adventures on their respective blogs! Angela (Get Knotted Yarncraft) and I, living out in the sticks (Southern Hemisphere) were unfortunately not able to be there in the flesh. 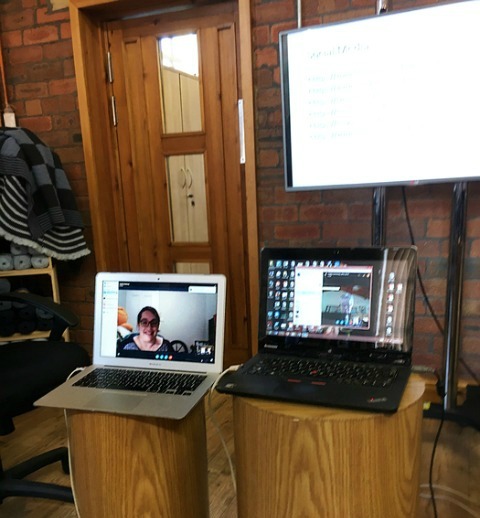 Thanks to technology, however, we were able to connect with the meet up via Skype on Saturday, 4 February 2017. I was so excited on Friday night I could not even sleep. Hubby stayed awake with me and we watched telly. Saturday morning I set up a camping table next to my laptop with the two bags ready to be opened! After a few failed attempts Angela and I were connected to the meet up, via two laptops that had been set up for us. Here you can see Angela (on the left) and me (on the right) joining in! It was so wonderful to meet everyone. 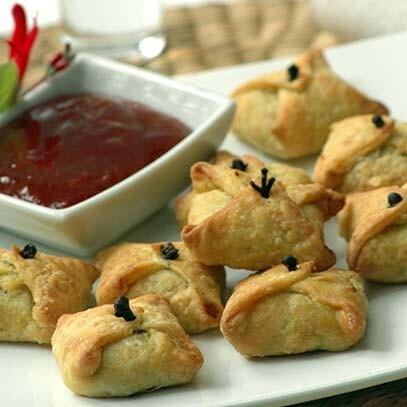 They are all just as lovely as you would imagine them to be!! When everybody was settled in their seats we were FINALLY allowed to open our goodie bags. Soooo much yarn. And sooooo pretty! There was a presentation featuring stunning items made from the new launch yarns, a social media presentation / discussion and a Tunisian crochet session. I have done some very basic Tunisian crochet before. It is a bit too slow for me - but I am determined to persevere and learn the more advanced techniques. The goodie bag yarn has been sorted into projects, prioritised by the dates on which I am allowed to share it with you. One of the new yarns, already available, is Jeanie Denim Look, a 60% cotton / 40% acrylic aran weight yarn in four "Denim" shades. For this yarn I have designed a texured, all seasons wrap with a beaded (optional) Fringe. February is the hottest and most humid(est) month here on the Hibiscus Coast! Most days I feel like I am melting and my brain just refuses to co-operate! Bigger projects will unfortunately have to wait until the heat abates somewhat. In the meantime I have been working with a package of Classique Cotton DK in 24 Gorgeous colours which arrived at our little Post Office last week. There are actually 26 x 50g colours to choose from - Seville (a bright orange) and Tropical Jade (a stunning aqua-ish green) are not shown in this photo. 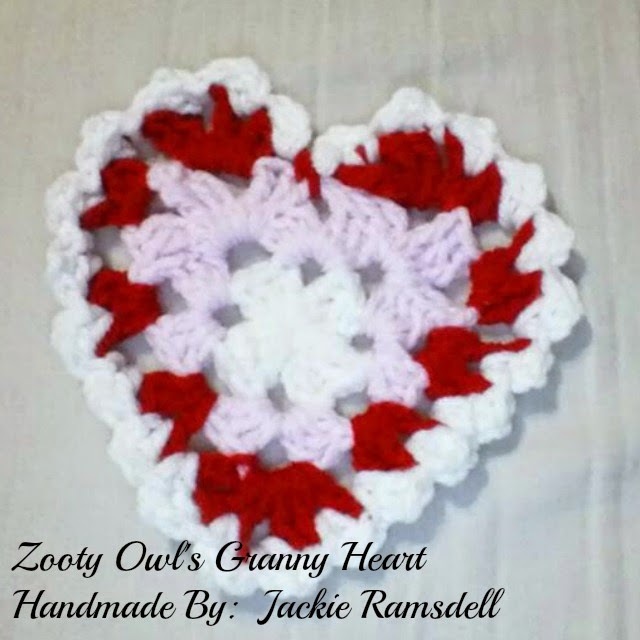 With Valentine's day just around the corner GRANNY HEARTS are a fun, not-much-concentration-required filler project. I have come to accept that there is always some compromise when working with cottons. The non-mercerised cottons are wonderfully rustic - but the splitting is enough to drive me to crazy. The mercerised cottons on the other hand work up neatly - but the sheen and the stiffness puts me off completely. The Stylecraft Classique Cotton is perfect! (Not just saying that because the cottons were sponsored by them). You can see from the photos that the cotton maintains it's twist - giving neat, tidy stitches all the way! Because the Classique Cotton does not "split" it can be frogged and re-used if necessary. Best of all, in my humble opinion, it is soft and has no sheen! The colours are vibrant and do not fade or run in the wash! 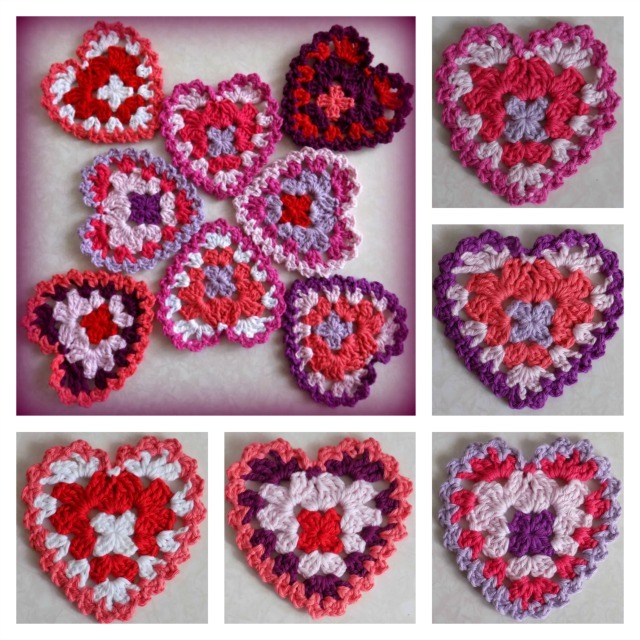 The 11 hearts I made from the Classique Cotton and 4 made from other stash cottons are destined for our local Hospice next week Tuesday. I have a bit of catching up to do with regards to social media. 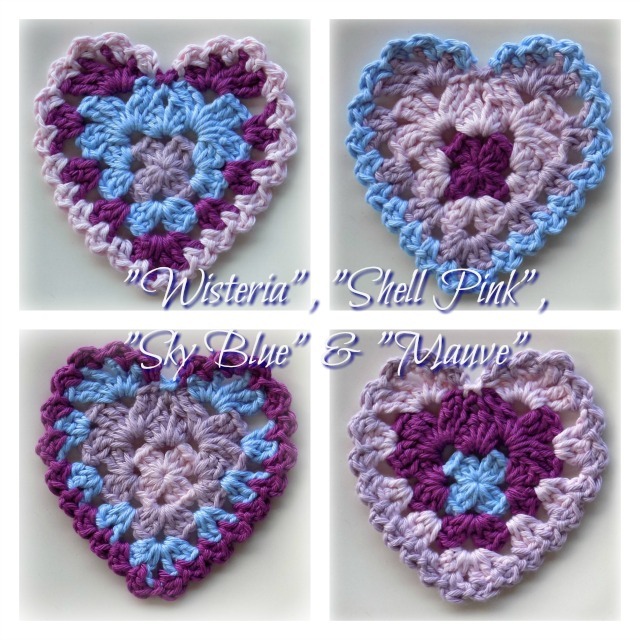 My Instagram account was opened ages ago but I have never posted anything - so that is the first order of business for me (other than all the crocheting!). Time for me to get some sleep. Goodnight all, wishing you sweet yarny dreams! Row 1: 3ch (counts as 1dc), 2dc into circle; (3ch; 3dc into circle) x3; 3ch, sl st into top of 3ch at start to close. Break off yarn. Row 2: Join yarn in any 3ch space. 6ch (counts as 1dc, 3ch), 3dc into same space (first corner); (3dc, 3ch, 3dc into next 3ch space) x3; 2dc into same space as start join; sl st into 3rd of 6ch to close. Row 3: Sl st into first corner space; (2trc, 3ch, 3trc, 3ch, 2trc) into next space between corners; sl st into next corner space; ((2trc, 3ch, 3trc, 3ch, 2trc) into next space between corners; sl st into next corner space to close. Break off yarn. Row 4: Join yarn in unworked corner (the apex or point of the heart), 3ch (counts as 1dc), (2dc, 3ch, 3dc) into same corner; (1ch, 3dc into next space) x2; 2ch, 3dc into next space; 2ch, (3dc, 3ch, 3trc) into next 3ch space; sl st to right of sl st in Row 3; sl st to left of sl st in Row 3; (3trc, 3ch, 3dc) into next 3ch space; 2ch, 3dc into next space, 2ch; (3dc into next space, 1ch) x2, sl st into top of 3ch at start to close. Break off yarn. and to John Kelly of HE IS HOOKED and Michelle Westlund of CROCHET BETWEEN WORLDS for proof reading the pattern!